Before talking about what is Goju Ryu we need to talk about Karate. It is a martial art developed on the Ryukyu Islands (Known now as Okinawa) Japan. It developed from the indigenous martial arts of Ryukyu Islands called te, literally “hand”; under the influence of Chinese martial arts. Karate means “empty hand” and is now predominantly a striking art using punching, kicking, knee strikes, elbow strikes and open hand techniques such as knife-hands, spear-hands, and palm-heel strikes. Historically and in some modern styles grappling, throws, joint locks, restraints, and vital point strikes are also taught. A karate practitioner is called a karateka. Now we can talk about our stile Goju Ryu, Japanese for “hard-soft style,” is one of the main traditional Okinawan styles of karate, featuring a combination of hard and soft techniques. 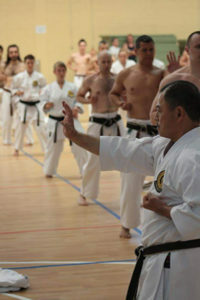 Both principles, hard and soft, come from the famous martial arts book used by Okinawan masters during the 19th and 20th centuries, the Bubishi Gō, which means hard, refers to closed hand techniques or straight linear attacks; jū, which means soft, refers to open hand techniques and circular movements. Gōjū-ryū incorporates both circular and linear movements into its curriculum, combining hard striking attacks such as kicks and close hand punches with softer open hand circular techniques for attacking, blocking, and controlling the opponent, including locks, grappling, takedowns and throws. Major emphasis is given to breathing correctly in all of the katas (detailed choreographed patterns of movements) but particularly in the Sanchin kata which is one of two core katas of this style. The second kata is called Tensho, meant to teach the student about the soft style of the system. Gōjū-ryū practices methods that include body strengthening and conditioning, its basic approach to fighting (distance, stickiness, power generation, etc. ), and partner drills. 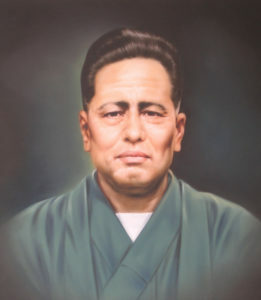 Goju Ryu was founded by Chojun Miyagi (1888-1953). He first learned martial arts from Ryuko Aragaki, who then introduced him to Kanryo Higashionna (Higaonna Kanryō) when Miyagi was 14. Under his tutelage, Miyagi underwent a very long and arduous period of training. His training with Higaonna was interrupted for a two-year period while Miyagi completed his military service. After Higaonna`s death, Miyagi travelled to China and he studied some local Chinese martial arts. He observed the Rokkishu (a set of hand exercises rather than a formal kata, which emphasizes the rotation of the forearms and wrists to execute offensive and defensive techniques), which he then adapted into the Tensho Kata. From the blending of these systems, and his native kwoledge, a new system emerged.